Joey Angnatok is a community leader from Nain, N.L. A hunter, fisherman, social entrepreneur and businessperson, he has worked with his fellow Inuit and university researchers collecting climate and other environmental data for three decades. In 2014, he was the very first recipient of the Inuit Recognition Award for involvement in Arctic research. Rodd Laing is the director of environment for the Nunatsiavut government. His research has focused on climate change impacts on sea ice, the marine ecosystem and contaminants and how these areas affect Inuit health and well-being. A circumpolar map comparing historic average minimum sea ice and average minimum sea ice in 2012. 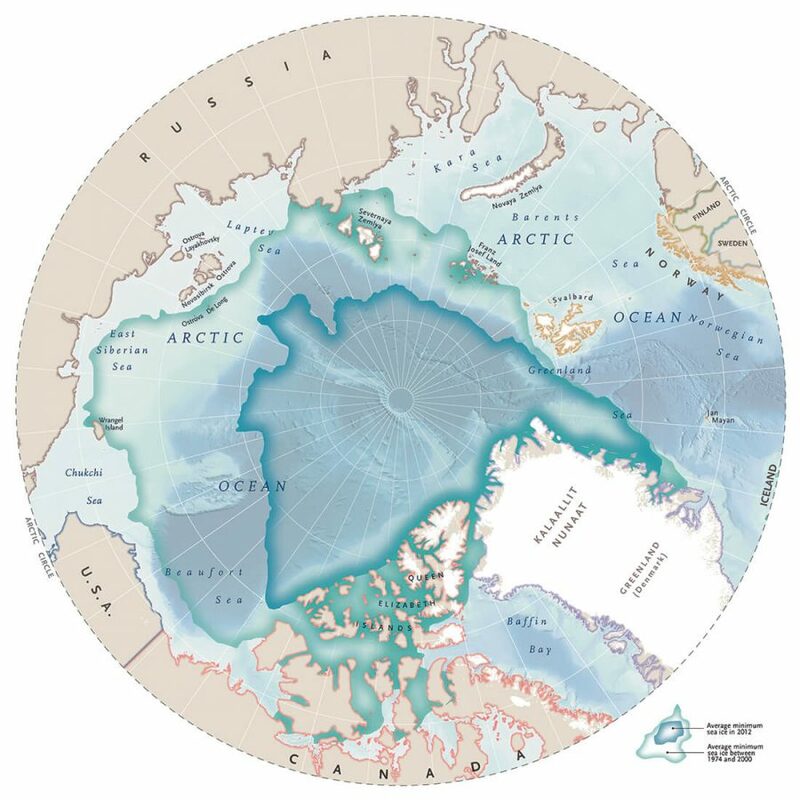 Sea ice is an integral component of the Arctic and Subarctic coastal environments. It is dynamic and its extent, thickness and distribution varies between seasons and years. It also varies in type and form, which are determined by the different physical and environmental conditions that cause it to form. For Inuit, sea ice is critical infrastructure and is a central part of culture, community and livelihood. Sea ice types include newly formed ice (weakly frozen ice crystals), nilas ice (less than 10 cm thick), young ice (10-30 cm thick), first-year ice (more than 30 cm thick) and old ice (ice that survived a full season, including melt). Sea ice forms can vary from small pancake ice (less than 3 m) to much larger ice floes (more than 20 m). Sea ice is usually classified as either pack (drift) ice or fast ice. Pack ice is generally made up of floes greater than 20 metres. It is dynamic and moves with currents and winds. Fast ice is attached to the shoreline, shoals or grounded icebergs and is relatively stable. Within sea ice there are areas of open water, called leads or polynyas, which are kept open by currents, tides and winds. These areas of open water are critical to the sea ice and ocean ecosystems. Melting multi-year ice in M’Clure Strait, N.W.T. Sea ice is more than just frozen water. During formation, pockets of brine form within the ice, providing habitat for bacteria and algae. These ecological communities remain relatively dormant during the darkness of winter, but when spring arrives with more available light and warmer temperatures, the ice ecosystem becomes much more active. Bacteria populations increase and the ice algae begin to grow, especially at the bottom of the ice where there is a steady supply of important nutrients. As the ice continues to warm and begins to melt, the brine pockets within the sea ice begin to connect, forming brine channels. This results in structural changes in the ice and in an export of brine, bacteria and algae to the sea water below, providing food and nutrients to the ocean ecosystem. For Inuit, sea ice is critical infrastructure and is a central part of culture, community and livelihood. Ice is an extension of the Land — its existence is imperative for Inuit to travel and access crucial areas, as well as being a platform to the ocean and its resources. Sea ice connects Inuit, allowing for travel between communities and the four Inuit regions that make up Inuit Nunangat. The ice also allows Inuit to access harvesting areas (both on land and water) at different times of the year, depending on the seasonal patterns of the species and the condition of the sea ice. Furthermore, sea ice connects Inuit to historical and culturally significant areas, including cabins, seasonal camps, traplines and harvesting areas. The connection between Inuit and sea ice is inherent, healthy and strong. Inuit have extensive knowledge about the different types and forms of ice, how ice changes in relation to environmental factors and what changes happen during the different seasons of the year. This knowledge has been passed on for generations and is imperative to Inuit use and occupancy of sea ice. Relying on this knowledge allows Inuit to safely access areas of importance, to travel to other communities and to harvest food and resources as needed, even during the times of sea ice formation and breakup. In Inuktut, the importance of ice is highlighted by the dozens of different words that exist to define things such as sea ice form, type, location and age. Joey Angnatok seal hunting near Nain, Nunatsiavut. The cycle of the sea ice formation, breakup and melt greatly affects the weather patterns and climate in the North. Reduced sea ice means more open ocean, more moisture in the air and warmer temperatures. It also means that once predictable seasonal weather patterns are now shifting and becoming unpredictable. Recent changes in the northern climate have led to increasingly dangerous sea ice and snow conditions, causing hunting areas and traditional travel routes to become inaccessible. The relationship between Inuit, environment and health is connected, and any change in the environment directly impacts Inuit health, including mental health, and well-being. Furthermore, the changes to sea ice do not just affect access to crucial areas, but they also affect the ecosystem dynamics of many different species of importance for Inuit, including those animals in the air, on the land and in the water. Inuit have implemented a variety of community-based monitoring programs to better understand the changing sea ice across the North. These programs are initiatives that provide opportunities for Inuit to measure and observe changes in sea ice and to understand these changes in the context of their communities and region. To better monitor the changes in sea ice in the North over long periods of time, Inuit are collecting baseline data on their surroundings. This ensures local residents are involved in research and monitoring, and that specific areas of concern are being addressed by the people who live there. Sea ice conditions are rapidly changing throughout the North, and Inuit are using their knowledge, in conjunction with modern technologies, to adapt and continue to use the sea ice as they have for generations.